Tuesday 5/16: Rest. I was supposed to work out but had to pack for DC and lost time. Wednesday 5/17: Our first day in DC! I never plan to workout on our first day, and this was no different. We got some solid walking in, though. How many steps are supposed to make a mile? My steps and mileage were drastically different from others' the whole trip. 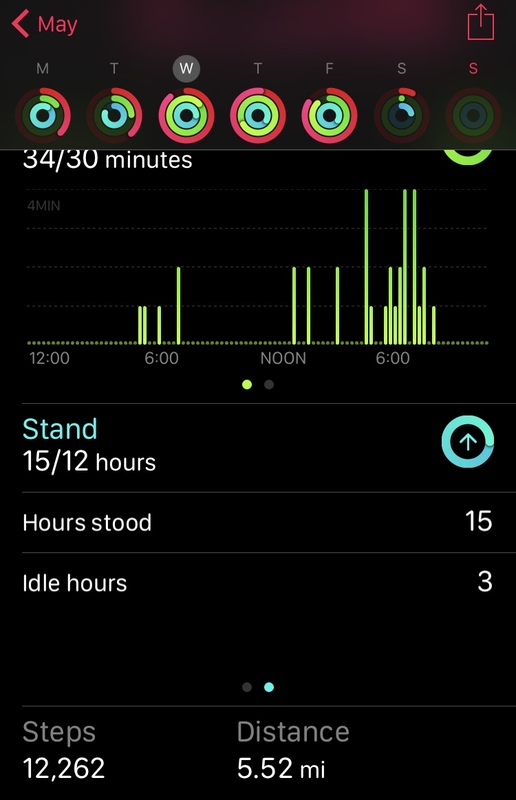 Thursday 5/18: I did some ab exercises when I woke up and watched my steps throughout the day, but there was no time for the gym or a solid workout. All that time standing was tough on my feet! Friday 5/19: I couldn't sleep and woke up before my "go to the gym" alarm (which was set for 5:07am) so I got to the gym early. I asked Stacey if she wanted to join and she said she didn't think so, so I left without her. I did about a mile on the treadmill (if my Apple watch can be believed) and literally cheered a few minutes later when the door opened and Stacey came in! After the run I did some weighted squats, presses, bicep curls, and planks. We flew home that evening after a weather-delayed flight. I was home and asleep around 11pm. Saturday 5/20: I literally slept until 12:30pm and then napped from 3:30-5pm. Major rest day! Sunday 5/21: Rest. I needed a day of housekeeping after travel! 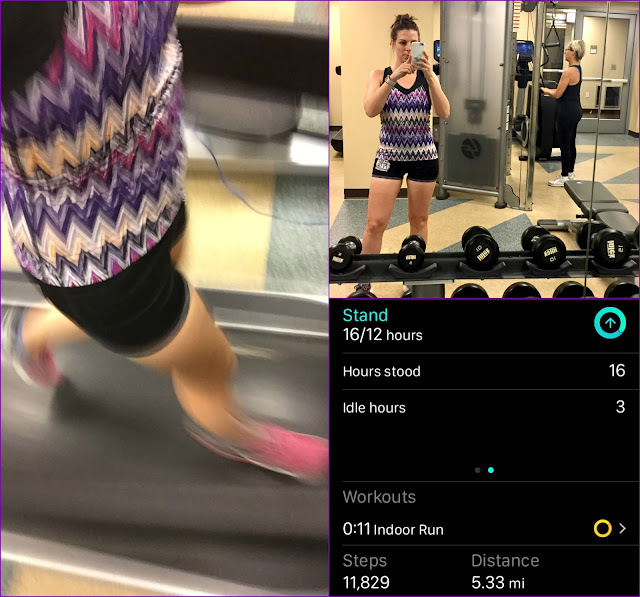 This week was almost a total loss as far as structured workouts go, but sometimes that happens! This week is the last week of school, and I know it'll be exhausting but I'm planning to get some good workouts in! Last week! Woohoo, I know the feeling! You did what you could when you had a chance :) That is what counts! What did you do in DC? Sometimes while traveling or doing work related activities, I struggle with adding a work out to my to do list... I always let it go. When it comes to travel I always have the attitude "if it happens, it happens". I used to put a lot of pressure on myself to keep up a routine but honestly, it's not worth it! Sometimes both my body and my mind need a break from daily workouts. Our last trip to Mexico I ran one day...the rest of the time I just "played" ... oh, and drank a lot :) Don't regret that one bit. Workouts are always there when you are ready to come back. Is today your appt w/ the doctor on your calves? If yes, good luck. I hope you can finally get some answers. I really don't stick to any sort of workout routine when I travel. I hate having to stress about when I'm going to squeeze in a run and I'm not going to get up super early to do it - I'm on vacation! I feel like I need to prioritize spending that time with family/friends, so when I travel I pretty much just assume it's going to be almost 100% time off from running (unless I'm visiting family back home). 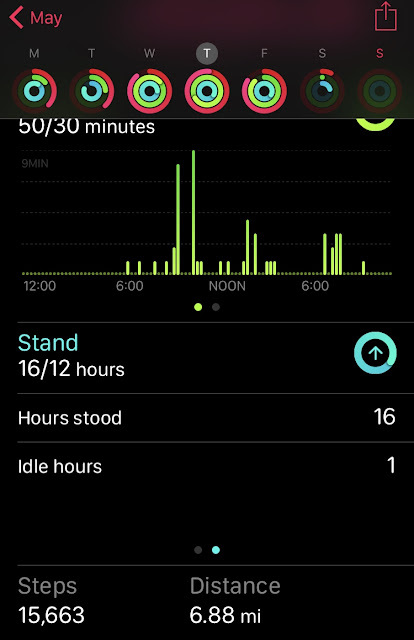 When Kevin and I were in Zion, he somehow logged 5,000 more steps than me (on a 25,000 step day) even though we did the exact same things all day. I think leg/stride length and variance in device sensitivity explains a lot of the discrepancies. Even with all that walking you still managed to get to the hotel gym, good for you. I hope you enjoyed the trip. My teacher friend also took her class to D.C. They didn't love it :( Cool that your app tracks how much you stand!